I used to think gardening would be hard and tricky to grow vegetables, I grew up seeing my wonderful Granddad carefully tend to his garden and enjoyed eating the tasty produce. After he passed away I really wanted to learn gardening as a way to keep his memory alive. 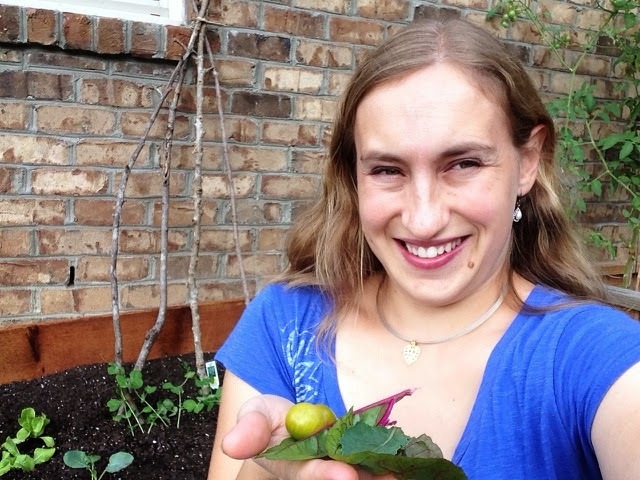 Also as a dietitian and lover of food, I really wanted the kids to grow up with a garden and have a connection to how their food is grown. I recently completed the Master Gardeners course and am now volunteering in local community gardens, school gardens and scenic gardens. I am learning lots especially as you spend time with other more experienced folks and get your hands in the soil. 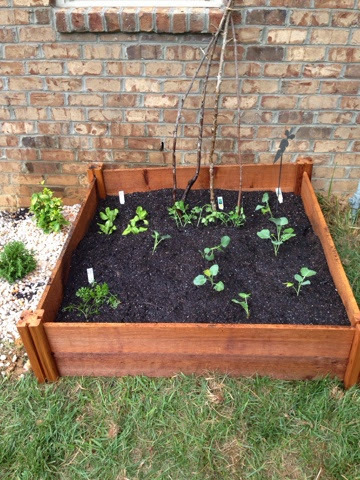 I have two small raised beds along the side of the house and the other day was looking at Crate and Barrel online and spotted a great deal for a square foot garden, I figured why not add another and grow some more food. There's still time for a fall/autumn garden. 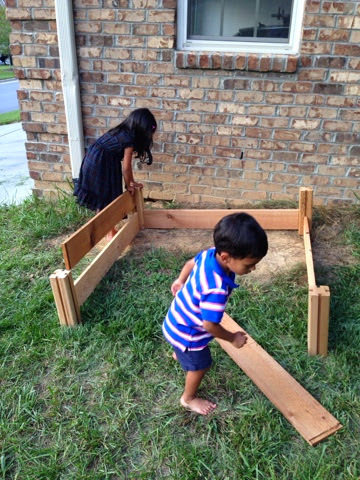 Raised beds are great when you don't have much space, and can tailor the soil, its easy to pull weeds and I think they look pretty in your landscape. Vegetables have pretty blossoms my favorite being okra. 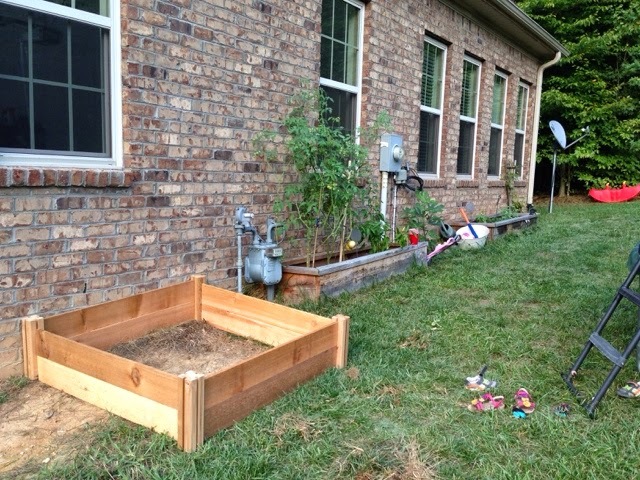 You can either build a raised bed or buy one like this. I was surprised at the ease of putting it together it took about 10 minutes. This one was unfinished wood so I added a coating to make it more weather proof. 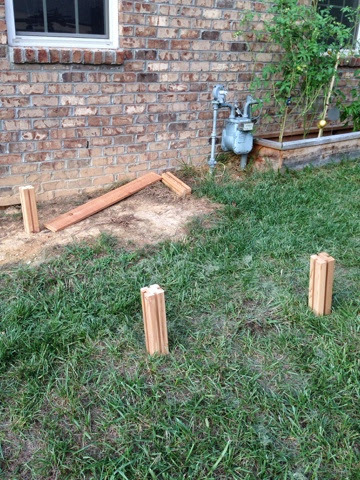 Add about 6-7 bags of soil and ensure that there is no grass underneath you can always use plastic sheeting to kill the grass or dig it up. Its a good idea to have a soil test and often its free at your local Cooperative extension office. The results will tell you the pH and if any nutrients need to be added such as nitrogen or lime to adjust the pH. pH is important as it makes nutrients more available to the plants. I added some top soil then garden soil. Next choose the crops to plant depending on the season, for a fall garden you can start with seeds in August as the weather will be warm and allow germination. However if a little later simply buy transplants from a farmers marker or local garden center. For a fall garden cool season crops like spinach, carrots, potatoes, onions, leeks, radish, swiss chard, mustard greens, kale, collard greens, sugar snap peas, broccoli, cauliflower, cabbage, lettuce and turnips. In the summer tomatoes, cucumber, lettuce, fresh herbs, eggplant, green beans, peppers, squash and so much more. Carefully plant the transplants and water well for the first few days, monitor the weather and if it hasn't rained add water. When watering aim for every few days deeply as it ensures a good root system and makes them more drought tolerant. Then smile and watch the magic as these little plants grow, flourish show off their blossoms and invite bee's and insects to pollinate them and produce delicious and nutritious vegetables to enjoy. One of lives greatest joys is popping into the garden and graping fresh vegetables bringing it to the kitchen and cooking it. I am still learning as a gardener but ask questions anytime I would be thrilled to help you along your gardening journey - you can do it, its not so hard and so rewarding.